I’ve made this twice in the past two weeks for company and both times it got rave reviews! So Easy and So Fast! 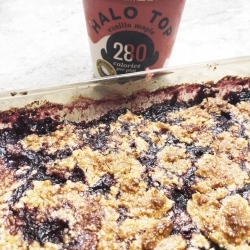 Serve warm with Vanilla Maple dairy free Halo Top for an extra special treat! Melt butter and combine with all crust ingredients. Pour berries in and 8×8 pan, dollop crust mixture in top and bake at 350 F for approximately 30 minutes or until lightly browned.